This cutaway view of Saturn's moon Enceladus is an artist's rendering that depicts possible hydrothermal activity that may be taking place on and under the seafloor of the moon's subsurface ocean, based on recently published results from the NASA/ESA/ASI Cassini mission. Researchers think microscopic grains of rock detected in the Saturn system by Cassini most likely form when hot water containing dissolved minerals from the moon's rocky interior travels upward, coming into contact with cooler water. Temperatures required for the interactions that produce the tiny rock grains would be at least 90 degrees Celsius. On Earth, the most common way to form silica grains of the 6-to-9-nanometre size found by Cassini is hydrothermal activity involving a specific range of conditions. Namely, when slightly alkaline, slightly salty water that is super-saturated with silica undergoes a big drop in temperature. 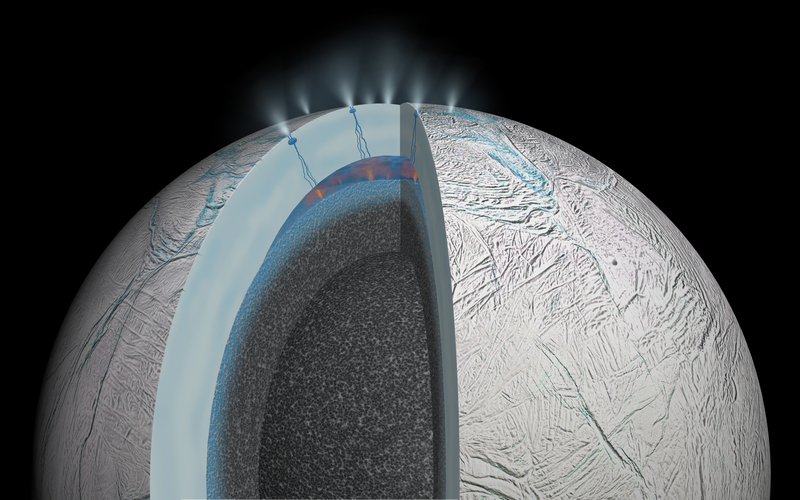 Cassini first revealed active geology on Enceladus in 2005 with evidence of an icy spray issuing from the moon's south polar region and higher-than-expected temperatures in the icy surface there. With its powerful suite of complementary science instruments, the mission soon revealed a towering plume of water ice and vapor, salts and organic materials that issues from relatively warm fractures on the wrinkled surface. Gravity science results published in 2014 strongly suggested the presence of a 10-kilometre-deep ocean beneath an ice shell about 30 to 40 kilometres thick.